In preparation for our forthcoming adventure we planned two weekends away cycle camping, trying the tandem with the (almost) full load to see what worked, what didn’t, and what the heck we were letting ourselves in for. We arrived early doors at Boston’s North Station. Frog had done all the planning – route selected, campsites booked and paid for, train tickets booked with bike allocation. We, like every other Boston resident, grabbed a Dunkin’ Donuts for breakfast and readied ourselves for the train. Alongside us were a variety of people, weekend workers, excited people ready for the long weekend, other people with bikes – the buzz and hum of a long weekend permeated the station. Of course we stood out – a couple of weirdos with a long bike, covered in brightly coloured bags, dressed in dorky lycra – we were happy with that and very excited for our first real weekend. As the platform was announced we joined the throngs of people going to the train, us looking for the assigned bike carriage. And then the blow was struck – despite Amtrak advertising this train with a bike carriage – and us booking tickets with bikes assigned, the train arrived without it and thus no space for any bikes. We tried to squeeze onto the train, but the train guard would not let us board, nor the other people with “normal” bikes. We tried to book on the next train, which would be 3 hours later – leaving us with too little time to reach our pre-booked and pre-paid campsites, that day, and the next. The information desk told us that the bike carriage was full, so we could not travel on that train either. After some drama, and some tears, we discovered that Amtrak had lied to us and that the bike carriages were broken and not available at all that weekend, despite them selling us tickets for that purpose. After some exploding emotions, we started to replan. 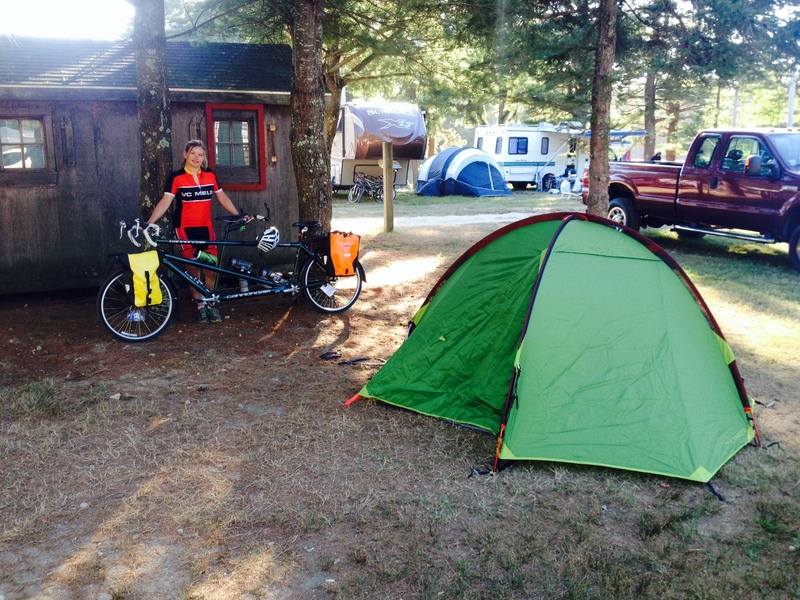 With the help of Yelp.com we identified a campsite within a half day ride south, towards Cape Cod – the roads would be ugly, getting south out of Boston on a bike is never pretty, and the disappointment of plans ruined and wasted by Amtrak lasted with us a long time. We got on the road as soon as we could and set about peddling south. The roads are large, but bike lanes are well marked and we passed through South Boston, past a carnival and out onto better roads pretty efficiently. We saw one car crash – I thought that was pretty good considering! This was the first time we rode the bike fully loaded, and we were finding that this was a different sensation from the simple riding we had done around Boston and on the Boston Bike Party. A tandem is a different beast to a normal bike – it can fishtail at any time, and any excessive movement by ever the captain or the stoker generates some disconcerting wiggling in the bike frame, which can amplify into losing control and crashing. And that movement can be scratching a tender part, watching a bird go by – anything! When you add on the full camping load this then becomes amplified. Tandem design is discussed here (https://badgerandfrog.com/tandem-design/) and our kit selections are discussed here (https://badgerandfrog.com/kit-for-our-adventure/) but at a very high level we were riding an 18 kg bike with 150 kg of bodies, plus pannier racks pannier bags, and tent, stove, clothes, medical supplies, water, computer, solar charger, cameras, phones, chargers, tent, sleeping bags, food etc coming in somewhere at a grand total of somewhere around 220 kg (circa 480 lb) of moving mass. Holding onto the bike and controlling that mass across the contact points of the feet, hands and bottoms was proving a new and interesting experience. I had sore hands, numbness in my arms and feet, and a sore bum. On the road we bumped into several other riders, some of them also on touring and camping weekends. In particular we bumped into Bryan and Leslie and had some very interesting chats with them – Bryan builds his own bespoke bikes, check out his work at http://www.royalhcycles. com. We found the campsite we had selected, Ellis Haven campground (http://www.ellishaven.com) on the outskirts of Plymouth – famous for the Plymouth Rock – alleged site of the landing of the first settlers, with a replica of the Mayflower ship that transported them alongside. The town is lovely, and the campsite was incredible. I think we were the only tent, otherwise it was all super large campers with big families cooking with a huge amount of organisation and infrastructure – cookers, marquees, chairs, bikes, dogs – and of course plenty of beer. The campsite has lakes and entertainment for kids, and we were lucky enough to have live bands for the two nights we were there – not quite the wild camping experience we were preparing for, but a nice start into our first trial of the adventure. We spent the days exploring the area and rode the channel that splits Cape Cod from the mainland – learning how to handle the bike in strong winds. We tried to design the most pleasant/efficient route using googlemaps, only to find ourselves in the middle of Cranberry fields ! We decided to keep going, as manhandling the bike through sand pits where you cannot possibly pedal was good practice for what might beset us in future… but from then on we’ve only been trusting our compass and barely using the GPS (exclusively for finding the best routes for exiting cities and locating bridges). We shut down camp on the third day, worked out how to get everything back in the bags and bundled back to Boston as fast as we could. In summary, we found that nothing really worked out, we got a bit wet, we got lost, Amtrak let us down, but we were able to pull together, and find solutions together. This is a huge positive and has made us very content as we start to stare down the big adventure which starts very shortly indeed. This entry was posted in Uncategorized and tagged Amtrak, Bike, boston, boston bike party, camping, cannondale, cape cod, Cycle Touring, Cycling, kit, maine, plymouth rock, Tandem, yelp. Bookmark the permalink.